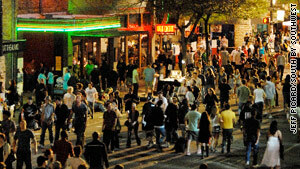 People flood 6th Street in Austin, Texas, during the annual South by Southwest Conference. Austin, Texas (CNN) -- For techies, the South by Southwest Interactive festival produces a firehose of information. With keynote speeches, hundreds of panel discussions, a trade floor full of new gadgets and nonstop networking opportunities with 15,000 or so like-minded folks, it's impossible to take it all in. It also may be too soon to pinpoint the most important things to come out of the festival, which ended Tuesday. The most significant outcome may be an idea sparked in a panel or a party conversation that someone takes home and turns into the next Facebook or Twitter. But after five days of reporting, we can identify some key themes. So here, in no particular order, are five observations from five days in Austin. Maybe it was those glitches that plagued the launch of Google Buzz a few weeks before the festival started, but online privacy seemed to be on everybody's mind. When Buzz first rolled out, becoming friends with someone through Google let you see who their other friends were. Since the feature's default made you friends with people you email, it gave others a free look into online activity most people want to keep to themselves. "People care very much about privacy no matter how old they are," said festival keynote speaker Danah Boyd, a noted social media expert. "The challenge is [that] what privacy means may not be what you think. When people feel like they don't have control over their environment or their setting, they feel as though their privacy has been violated. And they cry foul." In panel after panel, the question of online identity and sharing came up. Developers are at work on a real-time Web that would feed us information we're interested in almost as soon as it's created. But first they must figure out a way to do that while letting the people who create the information have a say in who gets it. The buzz about location-based social games like Foursquare and Gowalla also had information-sharing on everybody's mind. Both applications raise Boyd's privacy-control issue again: Managing "friend" lists and the places your information gets sent become a bigger deal when you're telling people exactly where you are at any given time. South by Southwest (SXSW) left little doubt that "the new privacy" is going to be a tech issue we're talking about for a while. One of the festival's most anticipated moments was a keynote interview with Twitter CEO Evan Williams, who introduced an @anywhere feature that will let users use Twitter without leaving other Web sites. The in-person response to Williams' announcement was less than enthusiastic. The audience had been expecting bigger news, such as the roll out of advertising on Twitter, but it will still be interesting to see how @anywhere takes off. The app works with news sites and other places on the Web to let users interact directly with Twitter from whatever they're reading. Example: You see a band mentioned in a music article and click to instantly follow that band on Twitter. Some insta-pundits have predicted the app will struggle because established Web sites won't want to give readers more chances to click to somewhere else. But we're not sure that's going to happen. While details about @anywhere remain sketchy, it appears that users would not actually be redirected from other sites to Twitter. At any rate, the new feature marks one more way social networking is weaving its way into all aspects of online life. If there was a pinstripe suit in Austin this week, we didn't see it. The movers and shakers of the online world are young, casual and come at business from a different angle than their Wall Street forbearers (a fact not lost on SXSW Web Awards host Doug Benson, who joked that acceptance speeches would all be short because the winners weren't used to being out of their basements). But there's nothing like seeing tech's youthful leaders for yourself -- and all in one place. Once you've watched a company founder tossing fuzzy dice into a crowd of screaming fans or doing the backstroke on the floor of the Hilton lobby at 2 a.m., you won't think of "CEO" the same way ever again. The thinking has been that social-networking mammoths such as Facebook and Twitter have made news-sharing sites like Digg, Reddit and Mixx obsolete. Such sites have taken a hit, to be sure. But they may still have a solid future because of one of the things the Internet does best -- create communities. At the Big Digg Shindig at the world-famous Stubb's, it turns out that not everyone was there for the great set by The Walkmen. Festivalgoers crowded the stage to cheer a live broadcast of DiggNation -- an irreverent Webcast that celebrates the site -- and for CEO Jay Adelson's announcement that the site would be overhauled, making it faster and more personalized. Adelson said Digg still gets 40 million users every month. He also announced that leaderboards for the site's most popular curators will be coming back. There's a segment of folks out there who don't just want to see the story you posted, they want to vote on whether it's a cool story or not, see if other people agree and then chat with those people about the decision. Don't let the nerdspeak and the thick, black-framed glasses fool you. SXSW, as Foursquare's Dennis Crowley told CNN at the beginning of the week, is "spring break for nerds." And thanks to technology's increasing role as part of our social fabric, nerds (or geeks, as they prefer to be called) are cool. There may be big ideas, important announcements and cool gadgets being rolled out during the day here. But by night, downtown Austin is no place to be hunched over World of Warcraft. Twitter, Foursquare, Gowalla, Digg and social-media blog Mashable hosted some of the biggest parties of the week on 6th Street -- Austin's answer to Bourbon and Beale -- and elsewhere. And where else but at SXSW Interactive week will you see 1,000 or so people rocking out as a revived Man or Astroman (geek legends for playing the "Mystery Science Theater 3000" theme) end their set by deploying a massive Tesla coil? South by Southwest may be best known for its music festival. But don't sell its Interactive week short.